Allonzo Trier seemed destined for greatness from an early age. Dubbed a hoops prodigy at the tender age of 13 years old, Trier was featured on the cover of New York Times Magazine in 2009. He utilized the childhood workouts of Pete Maravich found on the internet, travelled and starred in the A.A.U. circuit, and even had his own line of clothing with the signature: “When the lights come on, it’s time to perform.” Throughout middle school, he and his mother moved to four different cities (Seattle, Dallas, Oklahoma City, and Tulsa) all for basketball. In high school, he was a McDonald’s All-American, a five-star recruit, and the Washington Post wrote that he “may be the purest high school basketball scorer in the county and the most devoted to his craft.” At the University of Arizona, he was the Most Outstanding Player of the the Pac-12 Tournament and Second-team All-Pac-12 in 2017. The following season he earned First-team All-Pac-12 honors. Unfortunately, he tested twice for PEDs, which Trier said was medication given to him due to a car crash. As a result, he was ruled ineligibile and declared for the 2018 NBA draft. Then one team did not believe. Then two. Then three. Then thirty? Like a bad nightmare that was set on loop, the 30 teams passed over him again. Undrafted. There were no believers in Trier, but on July 3, 2018, the New York Knicks signed him to a two-way contract. After balling out in the preseason, coach David Fizdale conveyed that he was indeed a believer in Trier, and declared that he would spend most of the time in the NBA, rather than the G-League. Fizdale kept his word and Trier received close to 21 minutes per game….and Iso Zo was born. Or better yet, Trier was Carmelo Anthony reincarnate. There were inconsistencies and plenty of bricks early on, but Trier eventually shed his Melo mask and…. Played 31 minutes off the bench. Trier had his Iso moments, but more often than not, he was initiating offense via pick-and-roll action and dishing out dimes. He’s explosive and finishes strong when he attacks the rim, but he always looks smooth and composed with the ball, and never seems to rush anything. He’s averaging only 1.8 turnovers per game and is shooting 49% from the field, 45% from downtown, and 82% from the charity stripe. I’m a believer in Trier. Only played 19 minutes due to fouling out. Easy to do against the front court of Blake Griffin and Andre Drummond. Or maybe he had to tend to his ark. Got the start again and played 36 minutes. Ho hum. Another double-dub, which gives him 15 in 22 games. 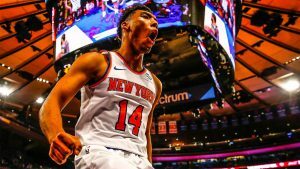 He should continue to start, as the Knicks have pivoted and are employing the “Trying to not get Zion” campaign. Eeny. Meeny. Miny. Moe. All the point guards for the New York Knicks blow. That’s six games now that Ricky Lake has scored at least 30 points in a game. That’s also now four straight games that Ricky Lake has had a bagel in the steals and blocks categories. Drum. Drum. Drummond. Not in the good way that got him on the lede a few weeks ago. It definitely was not Dre’s day, as he even missed two dunks. Played 27 minutes. Over the past six games, Jackson has been a top 70 player. The minutes have come down a bit from earlier in the season, but the shooting efficiency has increased. He’s not exactly moon walking over Ish Smith, but he’s still starting and getting more run than him. It’s usually awkward talking about this Johnson because he rarely delivers, but he’s been a top 80 player over the past couple of weeks. For the season, the usage rate has been in the 17 range, but that number has been over 20. Played 31 minutes and led the team in scoring. Kuzma is overrated for fantasy, as he doesn’t provide much outside of points, threeecolas, and boards. With that said, he does play close to 30 minutes for a team that is fourth in offensive pace. Didn’t you hear? LeBron wants to play until his son is eligible for the league. In order to last another five years, he can’t be going all-out every game. Also, give props to the Nuggets, as they are the fifth-best defensive team in the NBA. Only played 18 minutes due to an ankle injury. Status is unknown right now. Ball Boo Boo. Three Lakers scored in double figures and the team scored 85 points. No more blurbs for you!!! I’m old enough to remember when people were stressing on Millsap. Played 36 minutes last night. Beasley had been averaging 17 minutes per game. Beasley is the blowout indicator. Got the start and played 29 minutes. Zion who? So cute. He and Collins wore matching stat lines. He’s going to be a good one folks. We know he has range and we’ve gone over his excellent passing acumen. It’s the mental toughness that I’m most impressed with. The shots are going to fall, and when they do? Uno. Dos. Trae!!!!! Played 20 minutes. Is now relegated to a reserve role with Collins back. Can provide some goodies from time to time, but the minutes aren’t there for him to be a consistent fantasy contributer. Played 26 minutes and continues to come off the bench. Trade him already. Hassan played 25 minutes while Bam played 14. This is Hassan’s show, so Bam needs an injury to be the man. On the flip side, with how well Bam has been playing, he’s going to eat into and cap some upside for Hassan. With Goran Dragic and Tyler Johnson out…. Got the start and played 32 minutes. Showing that he’s not just a 3 & D guy. Played 26 minutes off the bench. Justise is not being served. Played 27 minutes. April 9th, 2019. My RichardSON!!! Top 40 player for fantasy. Played 37 minutes. In Rocky IV, when Drago fights Creed, Drago just jabs and chills for the first few minutes of the fight until his corner man yells something at him (I think he yells “Drago” but not sure). Anyways, that’s what I think of when I watch Kawhi play. Only when the Mother Ship gives him the go ahead will he unleash his full powers on the league. Has found his stroke after struggling there for a bit. Interestingly, last night was only the seventh time this season he’s scored at least 20 points. Whatever, as he’s dishing out 10.2 dimes a game, which is three more than last season. Only played 22 minutes. Vred FanFleet. Fred VanFleet. Fred FanVleet. Vred FanVleet. They all sound the same right? Geez, what time is it? Beats me. JV was not in foul trouble and he has had success against Gasol in the past. Only played 19 minutes due to foul trouble. Was that the first time Mr. Anderson has scored in double figures? Why the hell is the page loading so slowly? Mr. Anderson has scored in double digits four times this season. Mr. Anderson has played 20 games. Mr. Anderson needs to follow the white rabbit and locate Neo. Yeah. Yeah. They are good. Grit and Grind. Bump and Grind. Stat Sheet Stuff and Grind. Played 27 minutes. The minutes have been all over the map since returning from injury. Can’t trust him until you see him consistently getting at least mid-20s every night. Got the start and played 23 minutes. He’s a rookie doing rookie things. Sweep it under the Bridges. I wonder when/if the Regulators are going to mount up out of Phoenix. Ho hum. Another double-dub. Want to see how Ayton’s night went? Wait for it……. Just kidding. You’ll find out at the end of the post. Got the start at point guard and played 36 minutes. Me likey Point Booker. Continues to start with Victor Oladipo out and played 27 minutes last night. Continues to Tyreke up the joint. P. U. If the Thunder wanted to trade Paul George back to the Pacers, they’d have to throw in players to acquire Sabonis, right? I’m kidding. Am I? Sabonis has been a top 60 player despite averaging under 25 minutes per game. Played 24 minutes. Still no. I’m not a Collison guy. Usage rate is low and he’s so inconsistent, but he does provide dimes and steals on occasion. With that said, he’s my favorite player for at least one night. TIMBEEEEEERR!!! Hi, should I jump on the hype train and roster him in 8 teams, h2h league? Because I am following him for a while now, and waiting for the perfect time to pick him up. Possible dropping players will be Justin Holiday, Ingles or Good Ol’ Wiggins. @Max: By saying “him” I mean Trier. You know I’m not a Wiggins guy so…..
@Son: one more: trade Justin Holiday for Tauren Prince? I would prefer Holiday but Dunn and MArkannen are coming back and that could hurt Holidays production. What’s your take on that? 10 team head-to-head redraft drop Danny Green McGruder, or Wayne Ellington to pick up Will Barton? Good luck. Who you dropping? Richaun bud. Streamed him for the week and I’m impressed by what he did in their first game, however his limited playing time is such a bummer. Lol Your thoughts on Bembry? He’s got upside in steals and blocks, too, and I heard from multiple people that he passes the eye test. I just wonder if Atlanta can continue giving him ample minutes with Prince playing the same small forward position as he. @Son: true, at this point, in 12-teamers there’s not a lot of waiver wire gems anymore. Guys like Bembry, Trier could be a possibility but who knows if they will be given meaningful minutes consistently… Mikal on the other hand has been disappointing for a few games now. I know Canaan will be released soon but damn, I got no plans of tanking my FG%. Haha I like that I made it hard for you to choose. Hah Thanks man! @I just wanna Kawhi: I usually respond with “anytime” but, since you made me wanna Kawhi, it wouldn’t be right. Ha! Trier is available to pick up and Will Barton was dropped and will be available tomorrow I have Danny Green and Rodney McGruder I’m willing to drop and maybe Wayne Ellington .should I grab them both or just barton ? If just barton who to drop ? 1. With Barton due back any week now, I would like to fill my IR spot soon. 12 team, H2H league, 9 cats. Who do you stash for a March playoff run between Rondo or LaVert? My team below if it helps…. 2. My top two competitors do well in steals and assists. Would you add Barea to this group and cut either Bam or Saric? Collison or Trier? Should I jump on the hype train? @Son: He’s consistently mediocre and I feel like his production will settle when Oladipo returns. With that being said, I am punting assists and never found a place for him on my team. Screw it, I’m sitting in 1st place and i’ll go along for the ride! @Eddie Rooskie: Ha! Welcome to the dark side, where we crash and burn plenty, but oh baby….when we reach the light, it burns oh so bright. Great post about trier and i’m really intrigued. I think i’ll bet on him and believe as well. In 9 cat league, who’d you drop for him? I’m going to take a flier with Trier. Can’t fly if you don’t try! @Son: Haha instantly dropped. Just curious, what do you think of my team? love your blog, thanks for all the scoops! I’m worried that the return of Isaiah Thomas will impact the production of Jamal Murray… should I trade him before December and the return of IT? Any interest in Fox Mitchell and Brogdon for Bledsoe and Mirotic? 9 cat H2h. Got offered Middleton for my Marc gasol. what you think? or do you think I can prob get someone better than Middleton? @Justin: Gasol has been a top 5 player the past seven games and is #11 on the season. @Son: what about kemba and vucevic for gasol and oladipo. do you think the kemba side is safer/better? yo son. punt assist squad…. drop Jae Crowder for Shump?